Bob Whitesel, a professor at Wesley Seminary at Indiana Wesleyan University, has received the Donald A. McGavran Award from Fuller Theological Seminary for his scholarship and research into the field of church growth. The award was presented at Fuller’s recent commencement where Whitesel received a Ph.D. degree in church change, which is his second earned doctorate from the seminary. He also has a D.Min. degree from Fuller, which is in Pasadena, California. Whitesel’s recent award is the second award he has received that was named in honor of McGavran, who founded Fuller Seminary’s School of Intercultural Studies. The American Society for Church Growth presented the first award. The two awards are the highest given for research in the field of church growth. The Fuller award is not given annually, but only when the faculty determines there is a deserving recipient. McGavran dedicated his life to trying to overcome social barriers to sharing the Good News, particularly reaching out to the poor and disenfranchised in the caste system of India. Whitesel said he has met and talked at length with McGavran, but did not have him as a teacher during his days as a student at Fuller Seminary. Outreach, a national magazine, has called Whitesel the key spokesperson on growth theory in the church today. Ministry Today magazine has called him a leading consultant on change in the church. “I have studied churches and their leaders for almost 10 years, and I am continually energized when I examine how the younger generations are coming to Christ,” Whitesel said. 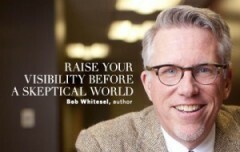 Whitesel is Professor of Missional Leadership at Wesley Seminary at IWU, which began offering classes in August. The seminary is the first in the history of The Wesleyan Church. Whitesel also is an award-winning writer whose books for the Wesleyan Publishing House include the critically acclaimed Preparing for Change Reaction: How to Introduce Change in Your Church. Two other books Whitesel has written for Wesleyan Publishing House concentrate on the spiritual journey seekers take. The titles of those books are: Spiritual Waypoints: Helping Others Navigate the Journey, which is for pastors and lay leaders interested in helping others along their way. Waypoint: Navigating Your Spiritual Journey, which is aimed at assisting seekers in their Christian journey.